I’ve always admired a fine craft-person in whatever medium they work. It was Ansel Adams that provided me with inspiration when I was developing my own photographic technique and I still use the zone system when working with 5×4 film. However I grew away from Adams’ Modernist aesthetic and reduced the number of his books on my bookshelf. I retain a few, mainly for nostalgic reasons, but I have far more Robert Adams than Ansel Adams in my collection now. 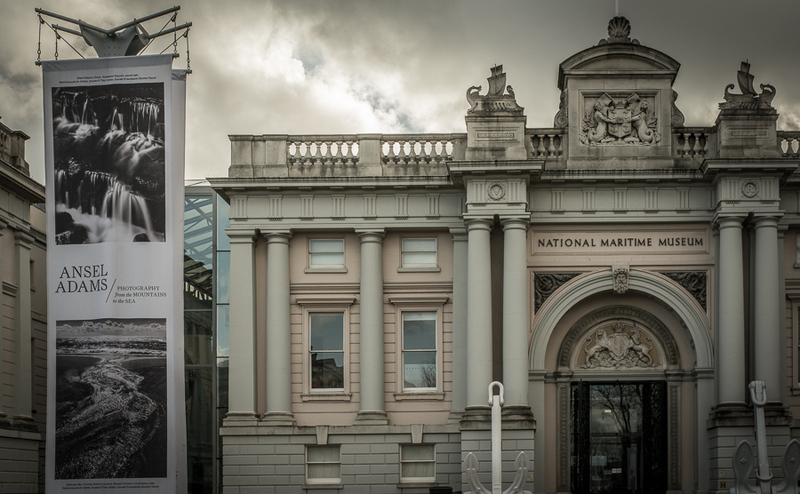 The National Maritime Museum, London, UK has an exhibition of his prints entitled “Ansel Adams – Photography from the Mountains to the Sea”. Not surprisingly given the venue, the emphasis is on his landscapes that include water in all its forms. And this set me wondering: How would I view his images after about 20 years of not seeing them? Is his craftsmanship still worth aspiring to? Does his aesthetic still have relevance today or is it consigned to history? Some of his early work showed a strong Pictorialist influence, with soft-focus and lack of detail. The 1920s were a transition time, with some examples showing sharpness and good tonal range but not with the degree of technical control we associate with his later work. There was one abstract work in the show but it is of unknown date and so not helpful in charting Adams’ progress. During the 1930s Adams was experimenting with sequences and what he called “extracts”, that is, showing small, isolated details of life & death, growth & decay, but not a true abstract. Around this time he also started adopting the Modernist aesthetic, and admired the Japanese woodblock prints known as Ukiyo-e, with flattened perspective, planes of colour and bold graphic elements. Adams, Ansel. c.1925. 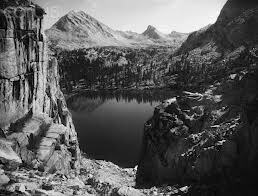 Marion Lake, Kings Canyon National Park. He would also photograph the same scene from different viewpoints and in different light. This is a technique he may well have adopted from painters such as Monet, as he increasingly photographed the light rather than the scenery. Adams’ prints from the 1940s and 1950s show noticeably high contrast with blank highlights and blocked out shadows, but by the 1960s his technique had improved and his control of tonal range was superb. His photographic style had also stabilised by the 1960s, with the frequent use of stark compositional elements to create tension or harmony, depth or lack of it. He often used leading lines of rivers or coast to guide the eye. Vees or inverted vees are frequent eye-guiding elements, and of course, he used diagonals to add dynamism. Above all, though, he used contrasting subjects as visual analogues to add depth of meaning to his images. Water adjacent to rock or snow against ice representing the animate and inanimate. Trees are also an important feature to imply the cycle of the natural world . I’m sure it is no accident that Adams photographed in the Grand Canyon only once (1942, as far as I’m aware), as I think the dominance of bare rock in this location would not have been to his taste. Adams, Ansel. 1942. 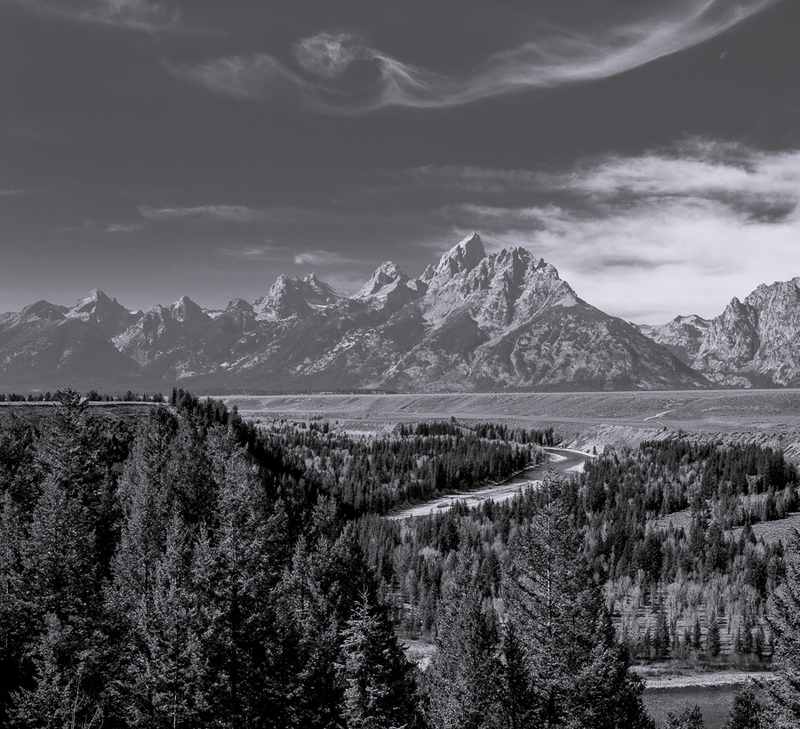 The Tetons and Snake River. So what about my original questions? 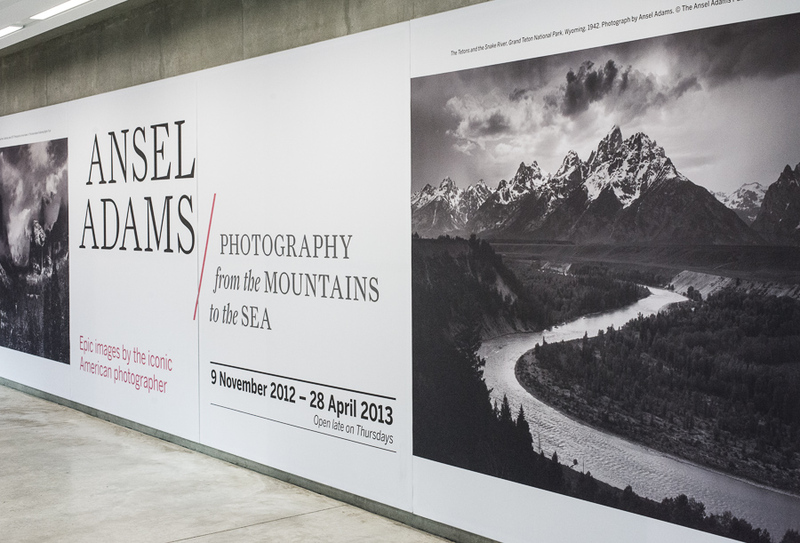 Ansel Adams became a master of his craft and did much to share this skill with others, though as he himself pointed out “…no one has approached the full possibilities of the medium”. The budding photographer can learn much from Adams’ techniques, especially if working with film. But even in the digital world the underlying lessons of control of tonal range can be applied, whether working in colour or monochrome. 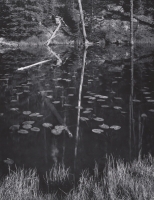 It is now possible to extend the tonal range of digital images well beyond the range of a single sheet of film but Adams’ images show us that this isn’t always desirable; we need the mystery of the shadows and the deep water. Aesthetically there is a place for Adams, though I regard him now as “traditional” and not to be slavishly copied. But many people like the traditional approach and when you are making a living by selling images, Adams provided, and still provides, what people are willing to pay for. For me he is a worthy icon but not to be held up as the ultimate role model in my own photography. This entry was posted in Landscape, Photography, reviews and tagged landscape, photography. Bookmark the permalink. I found some great Ansel Adams affordable giclee prints!